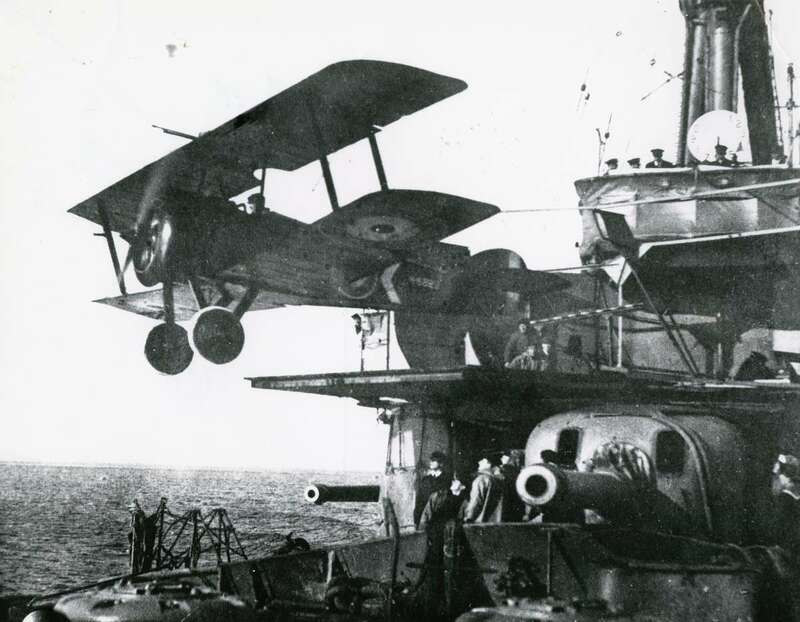 Above: A Sopwith 1½ Strutter takes off from a gun turret on HMAS Australia. For Imperial War Memorial footage of this event please click on this link. HMS Hibernia prepares to launch a Short S27 from a ramp on her foredeck in 1912. In 1903 the Royal Navy began experimenting with shipborne kites and balloons. Then from 1909 the focus moved to airships and aircraft. 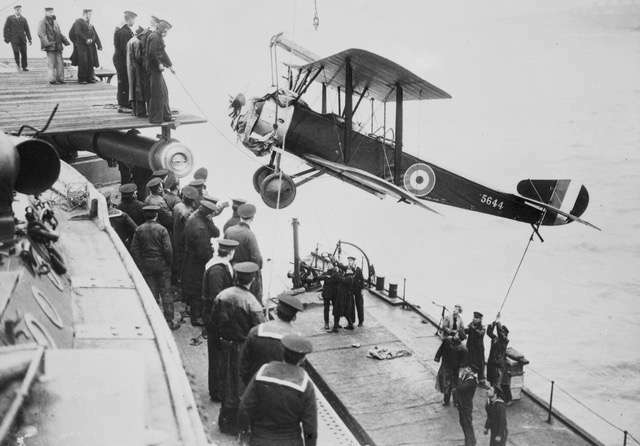 On 2 May 1912 a major advance was accomplished when a Short S27 biplane flew off a ramp on the foredeck of HMS Hibernia, whilst steaming at 10½ knots. The Naval Wing of the Royal Flying Corps was formed on 13 April 1912, and re-named the Royal Naval Air Service (RNAS) on 01 July 1914. 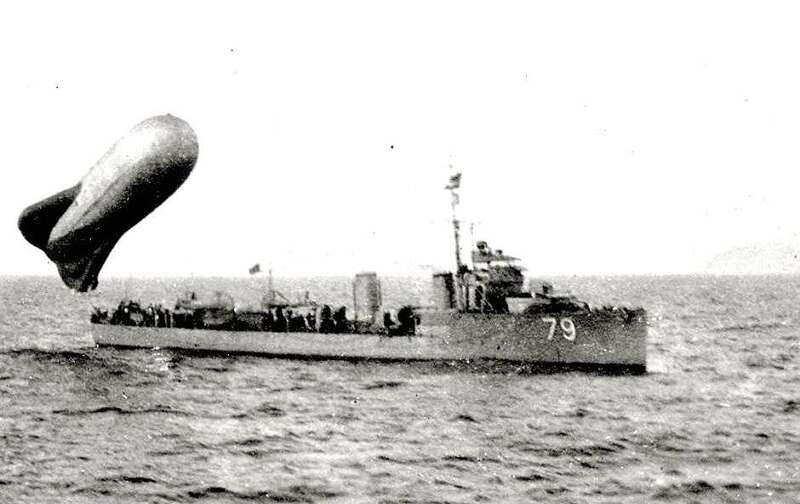 At the time, the German, Japanese, French, Russia, and United States Navy’s were conducting similar trials. The Royal Australian Navy was kept well informed of aviation developments and the advantages of using aircraft for reconnaissance, aerial photography, gunnery spotting, bombing, submarine, and mine detection. 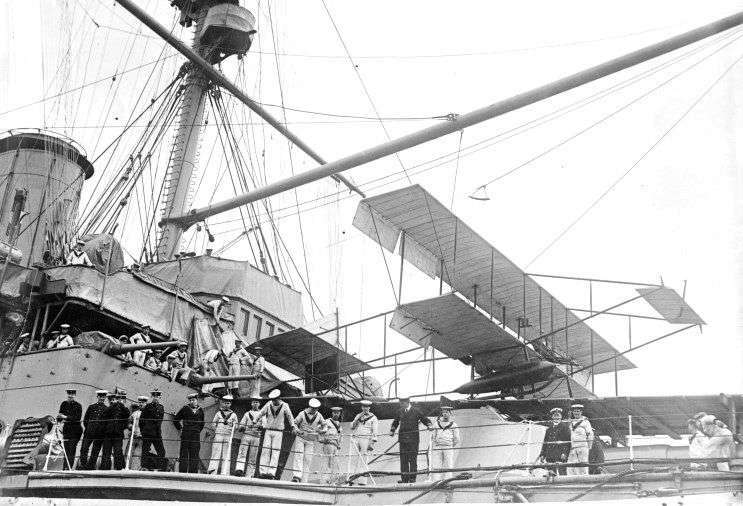 By 1912 the Australian Naval Board had a clear understanding of the benefits of naval aviation. In 1911 the Department of Defence called for mechanics and aviators to establish an aviation branch. A memorandum between the Naval Board and the Department of Defence in October 1912 indicates that plans for a Military Aviation School and Corps were well advanced – indeed, On 7 March 1913 the Central Flying School (CFS) was established at Point Cook, near Melbourne. The site had a large airfield next to Port Phillip Bay which was ideal for training Army and Navy pilots. bases equipped with two or three seaplanes, and advice on personnel, training, aircraft, machinery, the requirements for bases, stores, tools, and buildings, etc. ; together with the organisation of the force. The Admiralty response which arrived later in the year provided details for the formation of an Australian Naval Air Service. Using information based on the Admiralty plan the Naval Board prepared a funding request in March 1914 to be included in the Naval Estimates for 1914/15 – but World War 1 was about to intervene. Although the RAN aviation plans were temporarily shelved, it is worth noting that during WW1 it is estimated that more than 80 Australians travelled to the U.K to enlist in the RNAS to train as pilots, observers, or as maintainers – with many of the pilots distinguishing themselves in the service and later. When WW1 was declared on 4 August 1914 the Australian Government placed the RAN fleet under the control of the British Admiralty, and RAN ships were assigned to the British Home Fleet in the North Sea. In September 1914 the Royal Navy Air Service took responsibility for air defence of Great Britain to counter the U-boat and Zeppelin threat – with various Royal Navy ships being fitted with observation balloons and the means to launch aircraft. In 1917-18 the RAN battle-cruiser HMAS Australia (1) and the cruisers HMAS Sydney (1) and Melbourne (1) in the North Sea played a leading part in launching aircraft from gun turret platforms. But first a look at some of the RAN’s initial experiences with aircraft. The first RAN ship to embark aircraft was HMAS Una, the ex-German sloop KGS Komet captured in October 1914. Following a refit in Sydney in December 1914, Una returned to the former German colonies of New Guinea and New Britain with two pilots embarked together with a B.E.2a landplane and a Maurice Farman floatplane from the Central Flying School. Because the German administration surrendered peacefully, the aircraft remained in their packing cases and were returned to Australia early in 1915. In July 1915 the light-cruiser HMAS Pioneer and RANAS aircraft participated in the blockade of the German battle-cruiser SMS Konigsberg which had taken refuge in the Rufiji River delta in East Africa. Pioneer acted together with several RN cruisers and monitors in what proved to be a difficult task. Aided by several Sopwith, Short and other aircraft, the ship was located upstream. During the lengthy bombardment, the aircraft assisted with the fall of shot until the final sinking of Konigsberg. In 1917 the German raider SMS Wolf was creating havoc in the Indian Ocean, so the cruiser HMAS Brisbane (1) was transferred to Colombo (Sri Lanka), arriving on 4 May 1917. Here she borrowed a RNAS Sopwith Baby floatplane (N1014) from the seaplane carrier HMS Raven (11) to scout for the enemy raider. Whilst operating from Brisbane the aircraft was hoisted to and from the water by the ship’s crane. Despite wide area searches the raider was not found and the aircraft was returned to Raven. But Brisbane’s Captain Cumberlege was impressed with the performance of the Sopwith Baby and wrote favourable reports to the Naval Board highlighting the value of aircraft for reconnaissance. This was the first time the RAN used an embarked aircraft to fly operational patrols, and it was a significant occasion. The story of Brisbane’s Baby can be found here. In Britain, the challenge was to counter the German Zeppelins that were shadowing and bombing the RN fleet. Because the high-flying Zeppelins were out of reach of the ship’s guns, and floatplanes could not take-off in rough seas to attack them (and land-based aircraft lacked the range), the answer was to use embarked fighter aircraft. These were wheeled land planes that flew off special ramps constructed over the ships’ gun turrets. The RAN cruisers operating with the Grand Fleet in the North Sea took a leading role in this endeavour, with the battle-cruiser HMAS Australia (1) flying a Sopwith Pup off her quarter deck on 18 December 1917. Further trials were conducted during the Jan-May 1918 period with Australia sailing at different speeds, flying Sopwith Pup, Camel and 1½ Strutter aircraft off 30ft ramps mounted on the ship’s midship port and starboard 12-inch guns. A major advantage was that the turrets could turn into the wind, saving the ship from altering course or breaking formation. Rabaul: HMAS Ulna, the former German sloop KGS Komet captured in 1914 (AWM). flew off a 16ft flying-off ramp mounted over (but not on) the 6-inch gun on the foredeck of HMAS Sydney. Sydney’s Captain, John Dumaresq RN, was keen to operate aircraft from his ship having previously been bombed without success by a Zeppelin. Born in Sydney he joined the RN age 13 as a cadet and possessed an inventive mind. He had designed the highly accurate Dumaresq range predictor and was instrumental in developing a rotatable flying-off platform for light-cruisers. 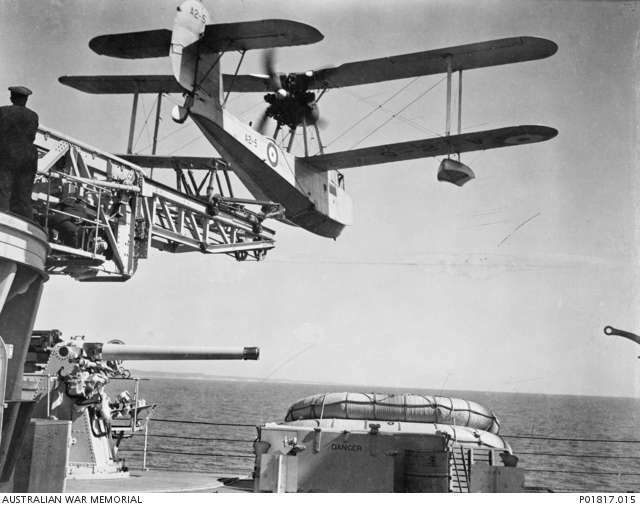 These were installed on HMAS Sydney (1) and Melbourne (1), enabling a Sopwith Camel 2F1 to fly-off under their own power into the wind – a major advance in fleet operations. On 1 June 1918 while the fleet was operating in the Heligoland Bight several German aircraft attacked the ships and Sydney and Melbourne, which launched their Sopwith fighters. Flying off Sydney, pilot Lt Sharwood chased the Germans for some distance until he could fire his machine-gun at one of the enemy aircraft, which nose-dived in a spin. Sharwood attempted to follow but was attacked from behind and fought back until one gun jammed and the other ran out of ammunition, forcing him to break off and head for home. After searching for some time, he sighted two friendly cruisers and several destroyers, before ditching near HMS Sharpshooter which rescued him. HMS Canterbury then picked up his aircraft. By the end of 1918 most of the large RN warships carried a wheeled Sopwith Camel fighter or a two-seater Sopwith 1½ Strutter for reconnaissance. Using land planes on battle-cruisers and light-cruisers was necessary because floatplanes required a calm sea to operate from (rare in the North Sea). Furthermore, the host ship had to stop to hoist the floatplane to and from the water, thus presenting a target for U-boats or Zeppelins. The requirement not to fit heavy floats further assisted the wheeled land planes, but after taking-off from a ship they had to find a landing ground, or the pilot had to ditch in the sea – hopefully to be rescued by a friendly warship. Because the airframe was relatively cheap wood and canvas, and the engine was often recovered, it was considered an acceptable risk in the face of the Zeppelin threat. In either case the ship had to return to port to embark a new land plane. The March 1918 Admiralty Memo advising the use of small aircraft on cruisers was not recommended and the Sopwith Baby, in particular, was ‘dying out’. 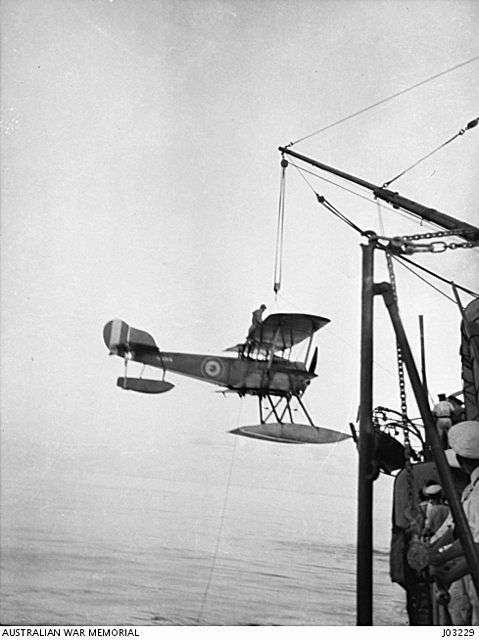 An Avro 504 being hoisted aboard HMAS Australia. Captain Dumaresq, an Australian, was recognised as an officer of exceptional talent and foresight. His biography can be read here. hour shifts would go aloft in a two-man basket to look for surfaced submarines or underwater shadows indicating the presence of a submarine. Directions by telephone cable to the towing ship would alert other destroyers to make an attack. Today anti-submarine warfare remains a major function of the FAA. In December 1917, following reports from Captain Cumberlege on HMAS Brisbane on the value of seaplanes, the Naval Board sought advice from the Admiralty of the cost of four Sopwith Baby aircraft or similar types, and crews to operate them. The response was the RN no longer planned to operate floatplanes from warships and as the Sopwith Baby was no longer in production the type was ‘dying out’. Then, in May 1918, the Admiralty was asked about providing a seaplane carrier of the Riviera-class to patrol Australian waters. This request was rejected due to increased submarine activity in the Mediterranean and the low risk in Australia. The British Air Board was then approached about providing airships and kite balloons and the means to operate them, but indicated that nothing was available until 1919. In May 1919 Admiral Lord Jellico arrived in Australia to review naval requirements for the defence of Australia. He submitted a comprehensive report in August 1919 that included a building and purchasing plan up to 1928. Much of the report was influenced by concerns about Japan’s growing maritime power, including recommendations for a large British Far East Fleet, which Australia and New Zealand would contribute towards. If this did not happen Jellico recommended that Australia should have a balanced fleet; including two battle cruisers, four light-cruisers and an aircraft depot ship to provide aircraft coverage for the fleet, and seaplanes based at major centres, including northern Australia. Clearly, Jellico considered aircraft as a necessary part of the RAN. [Jellico’s report is found on the RAN website here]. From 1913 the RAN’s sights were set on the development of Naval Aviation. In February 1917 this received a boost when Captain John Dumaresq RN transferred to the RAN and was made CO of HMAS Sydney (1). During his time on Sydney in the North Sea, Dumaresq became a staunch supporter of naval aviation and over the next few years did much to promote its cause. On 22 March 1919 Dumaresq was appointed Commodore Commanding the Australian Fleet, with HMAS Australia (1) his Flag Ship. 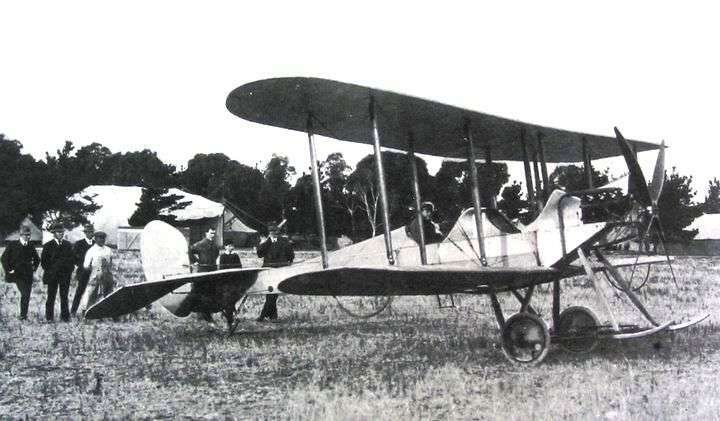 Before Australia, Sydney and Melbourne returned to Australia in June 1919, all aircraft were returned to the newly formed RAF, as without support facilities in Australia it was considered unwise to keep them. However, the light-cruisers kept their rotating flying-off platforms, which remained unused until eventually removed. This left the RAN with a good deal of experience, but without aircraft for an air service. On 15 June 1919, HMAS Australia (1) sailed into Sydney Harbour, with Commodore J S Dumaresq aboard. With a wealth of aviation experience gained with the Grand Fleet in the North Sea, Dumaresq persuaded the Naval Board to ask the Australian Air Corps (AAC) for an aircraft to conduct sea trials. On 10 July 1920, an Avro 504 was sent by rail from Point Cook to Adelaide where it was embarked on HMAS Australia (1). A pilot and mechanics with spare parts joined the ship, sailing for Sydney via Hobart (with HMS Hood and Repulse during the Prince of Wales visit). In September 1920, however, Australia was placed in reserve due to defence expenditure cuts, so the floatplane was transferred to HMAS Melbourne (1) for tropical trials. They proved the Avro 504 to be unsuitable, as you can read here. In June 1917, the Naval Board viewed a plan by Captain H L Cochrane, RN, for a RAN Naval Air Service. Seeking expert advice, the Board appointed Wing Commander Maguire, RNAS, who arrived in Melbourne in May 1918. Maguire’s ambitious report of 24 June 1918 for a Naval Air Service included seaplanes, air stations, a seaplane carrier, and a flying school. Shipborne aircraft were not included as they would follow once shore bases were established. The Naval Board accepted this and asked the Defence Council to assist with funding. Similarly, a month earlier the Army requested funds for aircraft and facilities. In due course a committee was formed to examine competing issues. By now Maguire favoured a single air service, like the UK [on 1 April 1918, the RNAS and RFC merged to form the Royal Air Force]. The Naval Board did not endorse this idea which was referred to a second committee. Due to the cost of separate Navy and Army air services, and unsolved administrative control issues, the single air service view gained support. On 18 December 1918, a new sub-committee endorsed the plan for a single air force to service Army and Navy needs. Although the RAN remained unwavering on the need for naval control, the 1920 Budget cuts ended that hope. The government announced that an air force would be formed, controlled by an Air Council with Navy, Army, and civil aviation representatives. After further study and government reviews the Air Council recommended (on 13 February 1921) that an Australian Air Force (RAAF) be formed from 31 March 1921, which the Minister of Defence approved – the ‘Royal’ prefix being added in July. Although the Naval Board was disappointed, the RAN Naval Air Service plan was doomed by a combination of factors including the political climate, post-war economic conditions, the Army/Navy administrative imbroglio and a confused government maritime defence policy. To assist the RAN the RAAF established a special Fleet Cooperation Unit to supply aircraft, pilots, and maintainers. Although in 1923 it was decided to train RAN specialist navigator/observers and telegraphist/gunners, the RAAF continued to service the RAN’s aviation needs until 1944. In April 1921 the government placed an order for six powerful Fairey 111D seaplanes to assist the RAN. Upon delivery the aircraft were transferred to the RAAF. The initial plan was to use them on RAN light-cruisers for survey, gunnery spotting and reconnaissance work, but they were too big and unwieldy. 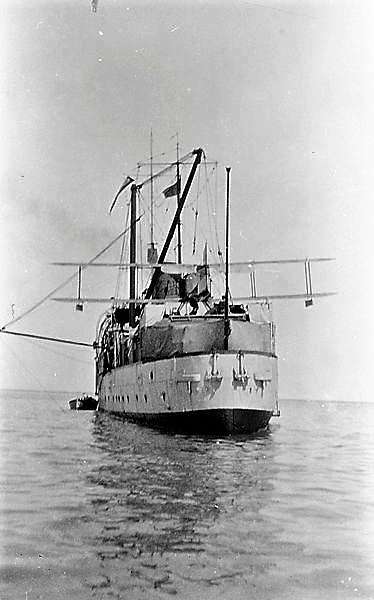 However, two Fairey 111D’s assisted at different times during the hydrographic survey of the Great Barrier Reef in 1924/5, working with HMAS Geranium (1) which was specially modified to carry a 111D on the stern, making it the first RAN survey ship to carry an aircraft. Another highlight for the aircraft was the 1924 circumnavigation of Australia by Wing Commander Stanley Goble and Ivor McIntyre, who surveyed the coastline. The Fairey 111D enjoyed a short life span, however: by 1928 they were redundant, and were scrapped the following year. You can read of Geranium’s embarkation here. Concerned by the outcome of the 1922 Washington Naval Treaty which placed limits on naval fleets, and the announcement at the 1923 Imperial Conference that work on the Singapore Naval Based was suspended, questions were raised about Australia’s defence capability. As a result the government ordered two heavy cruisers in 1924: HMAS Australia (11) and Canberra (1), both of which were capable of carrying seaplanes. Then in June 1925 it was announced that a seaplane carrier HMAS Albatross would be built at Cockatoo Dock in Sydney, to be launched in 1928. In the meantime, seaplanes were to be obtained and aircrews trained. On 22 January 1925, the Minister for Defence announced that the Naval Board had decided to form an RAN Fleet Air Arm, which the RAAF rejected as an attempt to usurp its position. After lengthy negotiations, the plan reverted to the 1923 RAN policy of training specialist observers and pilots – in readiness for the seaplanes planned for HMAS Albatross (1) and the heavy-cruisers – thus preserving the RAAF’s Fleet Cooperation Unit’s role in naval aviation. In 1925, the RAAF ordered six Supermarine Seagull 111 amphibians to replace the ageing Fairey 111D seaplanes. The Seagulls arrived in June 1926 and were assigned to RAAF’s 101 Fleet Cooperation Unit. By 1928, due to ongoing pressure from the RAAF, the RAN’s attempt to form a Fleet Air Arm was finally extinguished. In June 1926 the Seagull 111 amphibians arrived at Point Cook, then moved to a permanent shore base at Richmond, NSW. In August four Seagull 111s were positioned at Bowen, Qld, for work on the Great Barrier Reef survey until early 1929. The amphibians, housed in a beachfront hangar, would fly out to perform aerial surveys and photographic tasks, assisting the survey ship HMAS Moresby (1), alighting next her in sheltered waters. In 1927 a further three ex-RN Seagull 111s were purchased and the survey extended north to New Guinea. On 25 February 1929 six Seagull 111s were embarked on the new seaplane carrier HMAS Albatross (1) to exercise with the fleet; conducting torpedo and gunnery spotting, reconnaissance, and W/T duties until 1933; then Albatross was placed in reserve. In 1934/35 the Seagull 111s were embarked for trials on the heavy-cruisers HMAS Australia and Canberra. However, the Seagull 111s were found to be unsuitable, and by 1935 the robust Seagull V replaced them (read story here). Meanwhile, RAN ships continued to search for likely seaplane bases for defence purposes in northern Australia and Pacific Islands. HMAS Albatross, the RAN’s first aircraft carrier. She was obsolete before her time but still provided valuable lessons on the operation of aircraft from sea. The 1925 decision to build a seaplane carrier was prompted by security concerns. Until then seaplane carriers were mostly converted freighters, but HMAS Albatross (1) was a new design, which delayed construction. She was built to fit the the Fairey 111Ds, but by the time the ship was launched in 1928 the Supermarine Seagull 111 had replaced them. Albatross had three hangars under her foredeck with room for nine aircraft, but carried six; with three cranes to hoist aircraft to and from the water. Because the Seagull 111s needed a calm sea state to operate it restricted their use – leading to the development of the Seagull V (Walrus). Albatross exercised home waters with cruises to the Mandated Islands and Southern States. In April 1933 she was laid-up in Sydney Harbour due to Depression-era budget cuts, where she acted as a static seaplane tender. In 1938 the Admiralty accepted Albatross as part-payment for the cruiser HMAS Hobart (1) and in July she sailed for the UK, serving the RN in various roles including as a repair ship during the Normandy landings. During her service in Australia HMAS Albatross (1) provided valuable training, building a core of skilled personnel for the RAN and RAAF. See here for a more detailed article. Above: After a hefty thrust from the catapult Seagull V A2-5 is about to become airborne. During WW2 A2-5 served on several cruisers including the armed merchantman HMAS Manoora. ‘The Depression’ years of the early 1930s created economic conditions that forced the RAN to reduce fleet activities, with HMAS Albatross placed in second class reserve in Sydney Harbour. In 1935, the plan was to re-commission Albatross, so a catapult was fitted on the bow which was successfully tested using a new Seagull V, but the plan lapsed and Albatross remained in reserve. Meanwhile, the new cruisers began to embark their own aircraft. For a short time, HMAS Australia (11) and Canberra (1) embarked the older Seagull 111s – which were soon replaced by the more robust Seagull V.
was hazardous if the ship’s motion caused the aircraft to swing and hit the ship. Generally, this was avoided by using guide ropes and poles. During this time, the RAAF Fleet Cooperation Unit serviced the RAN with aircraft, pilots, and maintenance crews. Meanwhile, the Naval Board continued to wish for a fleet air arm under its own control. 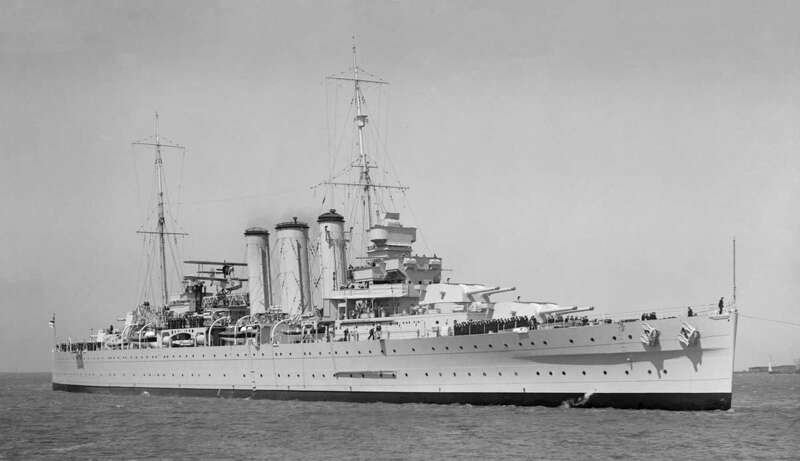 On 16 July 1935 HMAS Australia (11) joined the King George V Jubilee Review at Spithead in the UK. In September, at Portsmouth Naval Dockyard, a S11L catapult was fitted – mounted high behind the aft funnel. On 10 September, the cruiser hoisted aboard the first Seagull V, A2-1, and on the 12 September Australia sailed for the Mediterranean. But the sunny days of the Spithead Review were soon left behind as clouds of war began to gather. The rise of Nazi Germany; Fascism in Italy, Militarism in Japan, and Communism in Russia led to endless troubles that the League of Nations was ill equipped to deal with. HMAS Australia with its Seagull V high in the superstructure, circa 1937. A snapshot of the period shows Mussolini, on 3 October 1935, creating international tensions, with Italy invading Ethiopia. The 1935 -1936 London Naval Conference (to curb naval rearmament) failed when Italy and Japan walked out and Germany boycotted it, as Hitler was about to occupy the Rhineland on 7 March 1936; Japan (busy attacking China) had already begun a massive naval expansion. In July 1936, the Spanish Civil War erupted. Following the invasion of Poland – WW2 began on 1 September 1939. In Australia, the major concern was the threat the Japanese Navy posed and uncertainty about the ability of the RN to send a strike force to Singapore should war in the Pacific begin. During WW2, the Seagull V and Walrus aircraft served on HMAS Australia (11), Canberra (1), Hobart (1), Perth (1), Sydney (11) and the armed merchant ships HMAS Manoora (1) and Westralia (1). RAN ships also served variously in the Mediterranean, North Sea, Atlantic. West Africa, Caribbean, Persian Gulf, Red Sea, Indian Ocean, SE Asia, and Pacific. (For details on the Seagull 111 and V seaplanes, click here). By the start of WW2, the RAN and RAAF had established procedures for using the Seagull V amphibians on the cruisers. Their roles included gunnery spotting, convoy escorting, anti-submarine patrols and reconnaissance. While the RAAF continued to provide aircraft, pilots and maintainers, the operational control of aircraft and airmen was under the control of the ship’s Commanding Officer. This routine continued until February 1944 when the last Seagull V/Walrus was catapulted from an RAN cruiser. When war was declared, the RAN’s attention turned to the threat of armed German raiders attacking Australia’s shipping routes. In the early part of WW2 HMAS Australia (11), Canberra (1), Sydney (11), Manoora (1) and Westralia (1) did convoy escorts in the Indian Ocean, and searched for enemy raiders and merchant ships – making good use of their Seagull Vs. HMAS Australia, Canberra, Hobart, and Perth served with the RN in the Mediterranean with the Seagulls involved in bombing enemy instillations with several Seagulls crashing, including the loss of Australia’s Seagull V, shot down during the Dakar raid. Cruisers also served with the US Navy in the Pacific and Coral Sea. Aircrews, maintainers, and aircraft were lost when Canberra sunk at Savo Island, Perth in the Java Sea, and Sydney off the W.A. coast. In July 1941 Admiral Sir Guy Royle, RN was appointed Chief of Naval Staff (CNS) and First Naval Member of the RAN Naval Board. Royle had many years of fleet air arm experience and had been Chief of Naval Air Service in the RN. On 24 March 1944, Royle presented the Advisory War Council with a report, saying that an RAN aircraft carrier would be a valuable contribution to the Allied war effort. By now the Australian government accepted that a carrier was a necessary part of a modern naval force. In November 1944 Lt Cdr VAT Smith RAN, on loan to the RN, was drafted to Australia with three RN FAA Planning Officers, to establish shore-based facilities for the British Pacific Fleet (BPF) Mobile Naval Air Bases (MONAB). The RN adopted several shore bases in Australia to support its Fleet Air Arm, one of which was HMS Nabbington, at Nowra, later to become HMAS Albatross with Jervis Bay as a satellite airfield, and others at Schofields (HMS Nabthorpe) and Bankstown (HMS Nabberly). After the surrender of Japan on 02 September 1945 most of these bases reverted to the RAAF, with two going to the RAN FAA. Prior to V-J Day in 1945, the RAN Director of Plans, Commander George Gatacre, spoke to Lt Cdr Smith about post-war plans for the RAN which included acquiring two aircraft carriers, with three air groups, plus shore establishments and support facilities. Gatacre then directed Smith to prepare a draft plan for the RAN FAA. Because of the lack of details and limited resources the plan was reduced to a broad outline. Nevertheless, the Naval Board accepted this as an interim plan with instructions to take it to the next stage. On 20 October 1945 Smith departed for the UK to work on the details for the formal RAN Fleet Air Arm plan, modelled on the RN FAA now under Admiralty control since 1937. On arrival in London Smith began the process of filling the gaps in the RAN FAA plan. During his time, he was attached to Australia House, but worked at the Admiralty who provided a desk in the Directorate of Air Organisation and Training. For a year Smith gathered information by speaking to the planning experts, and providing regular reports to Navy Office in Australia. The next step was the formation and staffing of an RAN FAA Planning Office in Australia. Near the end of 1946 the Naval Board asked the Admiralty to loan three RN officers to assist with the Planning Office in Australia. As the plan would be complex and detailed, the requirement was for an experienced Fleet Air Arm captain to head the staff, an Air Engineering Officer, and a Supply Officer with Air Stores knowledge. Later a civilian officer from the Admiralty Director of Stores with detailed knowledge of stores and procurement was included. The staff began work in Melbourne in early 1947. VAT Smith was the fourth member of the staff with responsibility for training and air maintenance personnel. Below: The end of the journey! The Sydney Morning Herald of 01 September 1948 reports on the commissioning of the Air Station at HMAS Albatross, Nowra. The objective was to produce a comprehensive plan for the RAN Fleet Air Arm and to liaise with the RAAF to produce a joint report for the Naval Board and Air Board, which could be submitted to the Defence Council for approval and then for endorsement by Cabinet. The plan sought approval for two carriers manned by the RAN. Although the RAAF made strong claims for control, it was decided to give authority for naval aviation to the RAN. After Prime Minister Ben Chifley authorised the acquisition of two light fleet carriers from the UK, the Commonwealth Defence Council gave approval for establishment of the RAN Fleet Air Arm on 03 July 1947. On 15 August 1947 Cabinet ratified the status of the Fleet Air Arm to be under the control of the RAN, with two Naval Air Stations and three Air Groups, ending the RAAF’s involvement in naval aviation. The RAN’s 1st Naval Member, Admiral Hamilton RN contributed greatly to this outcome. The next step was the ordering of two Majestic-Class light-fleet carriers, together with Sea Fury and Fairey Firefly aircraft; the securing of Nowra and Schofields airfields, and the establishment of training facilities, maintenance, and logistic support. For recruitment, several RAN officers had already qualified as aircrew, also RAAF, RN and RNZN aircrew indicated a willingness to join, including ex-RN air maintainers, and a sizeable number of RAN sailors sought a transfer to the FAA. The Admiralty generously offered whatever assistance it could, with Captain Anstice, RN appointed Fourth Naval Member (Commodore 2nd class) to advise on Fleet Air Arm matters; Commander Turner became Director of Aircraft Maintenance; and Commander Robinson Director of Air Supply. In November 1947 Lt Cdr VAT Smith joined the staff of the Naval Liaison Officer, in London, as Air Staff Officer. His first task was to assemble the aircrews and maintainers in the UK for the formation of the RAN squadrons. Next came the training of aircraft artificers at RANAS Arbroath, Scotland. Then RAN sailors converting to air mechanicians and maintainers, aircraft handlers, safety equipment workers and so on. As Smith was their Australian Divisional Officer this involved much travel in addition to his other duties. In December 1947 Smith was promoted to Commander, later to play a leading role in the RAN FAA. Meanwhile, the airfield at Nowra NSW was being prepared for commissioning, by Commander HJF Lane, RN, as HMAS Albatross, on 31 August 1948. Then the second air station was established at Schofields NSW and commissioned on 1 April 1953 as HMAS Nirimba. A major objective was achieved with the commissioning of HMAS Sydney (111) on 16 December 1948. HMAS Melbourne (11) with her angle flight deck was commissioned on 28 October 1955.